"All Out Glam." 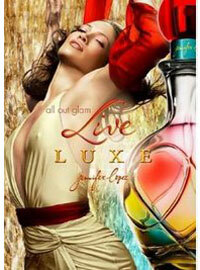 Live Luxe perfume by Jennifer Lopez is an opulent fragrance that makes you feel all-out glam! Indulge in the Moment with Live Luxe perfume. "Live Luxe captures the moment when I feel completely consumed by my passion for dance. It is a moment of total elation and complete, uninhibited indulgence," Jennifer Lopez. "Scents & Sensibilities. Just like high-school cliques, perfumes can have the reputation of being naughty or nice. Sheer florals are for good girls, while potent spices have racier associations. Yann Vasnier, a perfumer at Quest International, helps us understand the new fragrance double standard. Naughty: Live Luxe Jennifer Lopez. The peach-pear-and-freesia blend could easily turn sappy if it weren't for the bold and sultry hit of musk and amber, according to Vasnier. (Jennifer Lopez, shopjlo.com.)" Molvar, Kari. "Scents & Sensibilities." Allure Oct. 2006.